Vice-president for the Americas, Ralph Rogers was a guest at the second International Falconry Meeting in Argentina, held at the Municipal Balneario de Colonia Baron in the province of La Pampa 20-22 June. He describes it as "... a very fulfilling experience for me and an unqualified success for Argentine Falconry. The enthusiasm that falconers from 8 nations shared was palpable. This group of falconers is largely younger, few have experience of more than 10 years, and, luckily, they have enough good mentors to allow them the ability to see some excellent falconry. They do not need to discover everything on their own. We saw ducks caught with Harris Hawks, hares with eagles (A. mora), perdice, ducks, caught in excellent high flights with peregrines, and the abilities of the aplomado falcons are wonderful both off the fist and on ringing flights. I watched with about 20 Brazilians who witnessed high quality flights with wild game taken in fair chase. Falconry is experiencing a renaissance here, it is alive and well in South America." "IAF may have a great roll to play here. Already, perhaps partially because of our support, the credibility of falconry is gaining status rapidly. The Minister of Tourism of Argentina was here as well as all local officials from la Pampa Province. One of the houses of the Argentina Parliament formally declared this event of high cultural interest. There remains some misunderstanding with the Federal Fish and Wildlife department...perhaps IAF can work with local falconers to affect change over the next year. The Council of Delegates Meeting could be a very important component of this change"
here. Already, partially because of our support, the credibility of falconry is gaining status rapidly. The Minister of Tourism of Argentina was here as well as all local officials from la Pampa Province. One of the houses of the Argentina Parliament formally declared this event of high cultural interest. There still remains some misunderstanding with the Federal Fish and Wildlife department...it is here that IAF can have a profound effect over the next year." 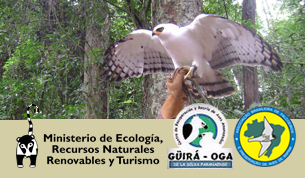 Güira Óga, from the Guarani language meaning "House of Birds", is a falconry and conservation organization founded in 1994. It was established in Missones with the support of local falconers and the provincial government with the objective to create conservation projects for recovery, breeding and reintroduction of raptors in the province using falconry techniques for that purpose. With the passing of time the primary objective was expanded beyond raptors to all endangered species in the province. Today it is one of the most respected organizations in the country and a national reference with regards to the recovery, reintroduction and breeding of raptors in Argentina. The Brazilian Association for Falconers and Preservation of Birds of Prey, ABFPAR, is a nation-wide nonprofit scientific society, which supports and implements initiatives focused on the study and conservation of Neotropical birds of prey. Currently ABFPAR has 90 members and is a full voting member of the IAF. It was founded in 1997 and was the the first institution in Brazil to obtain authorization to practice falconry to rehabilitate birds of prey. This commitment continues to the present day. The Ministery of Ecology, Renewable Resources of the Province of Missiones, Directorate of Biodiversity is the entity that regulates all activities related to wildlife, flora, hunting and fishing and tourism in the province. The M.E.R.N.R. , through an initiative of the Directorate of Biodiversity, will issue a resolution declaring the IAF meeting of cultural interest for the Province. "Falconry constitutes the most international of all the Intangible Cultural Heritage in UNESCO's history.In this traditional hunting art, man keeps and trains raptors to hunt wild prey in the natural environment. For over four thousand years, the falconer has been integrated in nature. This changes his status from spectator into participant. Thus he knows the wild, allowing him to think like a bird, think like the quarry and think like a human. We find examples of this alliance in art, ancient manuscripts, literature or poetry, in the cultures of different countries and in their religions. Over four museums are solely dedicated to the Art & Culture of falconry. Academic disciplines as significant as ornithology, veterinary medicine, the psychology of learning, ethology; all have their roots in medieval treatises written by falconers. The conservation of birds of prey began as a result of falconry. Moreover, falconry techniques are applied successfully in recovery, management and breeding of raptors. The requirement to go to the field daily to train and hunt with the bird of prey, remains in the modern urban man an almost forgotten link with Nature. International, national and local regulations regarding raptor conservation are addressed by the IAF which has a global role (more than sixty member countries) and which is associated with IUCN, UNESCO and CBD and the Bern Convention amongst other international organizations and conventions." An IAF presence at international conferences and conventions is vital to keep falconry safe. Javier's attendance in Florence was also important to us because, as an accredited advisory NGO to UNESCO Intangible Heritage Committee, we are obliged to show what measures are being taken to safeguard falconry. ʽ"The European Union, as a Party, would ensure a coherent EU position and be open to the concept of sustainable use at CITES negotiations. The European Union fully supports the principles of the Convention and is very receptive to the concerns of developing countries. Accession would enable the Commission on behalf of the European Union to lead negotiations and to be a catalyst in achieving a balanced compromise between the 27 Member States’ positions." This is quite worrying in many ways: it is not clear exactly what rights and obligations will the Commission and the Member States would have after the EU’s accession to the CITES and how the accession would affect EU procedures at CITES meetings (for example, who will lead negotiations, make statements and cast votes on behalf of the EU). Neither is it clear how the EU will agree a common position, or be able to change an agreed position, during meetings of the CITES Conference of the Parties when not all Member States are present. Under the Treaty of Lisbon the Commission may, in fact, adopt delegated acts giving them the authority to make decisions on behalf of EU Member States, in contrast with implementing acts which give Member States the decision-making authority. Some states (most notably the UK) are strongly resisting the use of delegated acts. This is the main reason why IAF needs to spend so much time following European legislation, so much international law originates in EU states and in Brussels and becomes world wide in its ultimate effects. We have known for a long time that the EU frequently votes as a block (28 votes), this accession will formalize it and virtually eliminate the possiblity of individual dissent.